I recently reread the following in an article/ sermon by Mickey Anders (Asking the Wrong Questions) relating to the gospel. When a group of tourists saw a legless war veteran go to the Shrine of Lourdes, they whispered and laughed, “Does he suppose God will give him back his legs?” The veteran overheard this remark. Turning to the group, he said, “No, I don’t expect God to give me back my legs. I expect him to show me how to live without them.” Perhaps if we just asked the right questions, we would discover that God is not in the business of bringing pain and suffering into our lives. Rather God gives strength to live even in the midst of the worst kinds of suffering. This I believe to be true… and it is a wonderful response to those who would question the existence of God, or who believe God is a God of anger and judgment. In the gospel for this week we will look at the many reactions to the story of the man who was born blind and received sight from Jesus on the Sabbath. Jesus uses the act of spitting, usually a sign of disdain for blind people, to instead heal the blind man. Each of the players in the story – blind man; Pharisees; parents of the blind man; neighbours; and Jesus have different views perspectives on this simple story. Which character in the story do you most identify with? Have you had a time when you saw with the heart and acted like the blind man recognizing the miracle and the healing acts of God in your life? Did you share it with others? Prayer: May we learn to look past the obvious, the expected, the traditional and the acceptable, and begin to recognize the new and the fresh ways you are at work in us, in our neighbour, and in the world. Amen. As I pondered the whole of this old prayer I remembered the practice of another friend who began each day by putting on the “Whole Armour of God” as Paul exhorts the early Christians to do in his letter to the Ephesians. Each morning we decide what to wear, we put on body lotion and sun screen, deodorant and the rest, we pack rain coat or jacket to prepare for whatever the day might bring, but how well are we prepared, spiritually. Perhaps we should not be worrying so much about what we might give up for Lent but how we could better clothe ourselves for our life in the world. 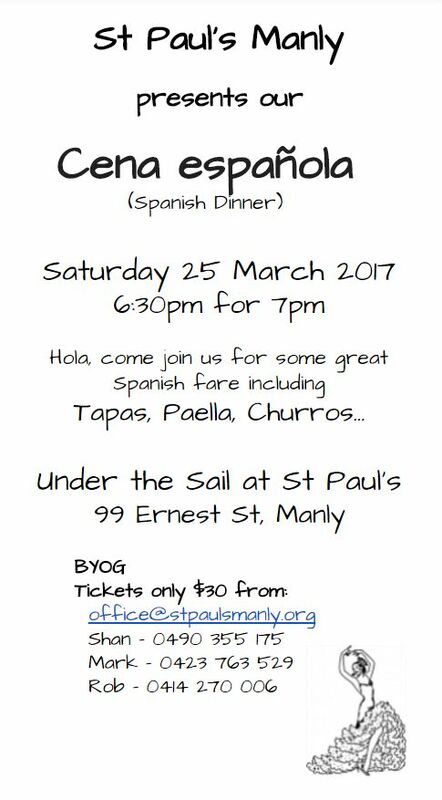 Come join us for our Cena española (Spanish Dinner) under the sail at St Paul’s from 6:30pm on Saturday 25th March 2017. Tickets only $30 for a wonderful 3 course meal including tapas, paella and churos. BYOG and come prepared to have fun! Last Sunday, I said that it was interesting that in the gospel for the week, God was heard (by Peter, James and John) not in the moment of Jesus’ transfiguration, but later, from a cloud. God speaks to us in our darkest direst moments – if only we will listen and look. Sister Angela Botti spoke to me on Wednesday of what she could only describe as a miracle of God’s creation. On a concretes pathway, in a small join between steps, she saw a plant flourishing and flowering. There was no soil, nowhere to hold moisture, nothing to cling into, but this plant (which was not a weed but she couldn’t name it) was strong and vibrant. She was moved to sit for a while and give thanks to God. Even in times of doubt and dire circumstances, God waits for us to turn and look and see (or hear) the signs of His presence in the darkness and dryness around us – so that we can go on and be the people God most desires us to be. When we seem the most depleted and feel the most empty, God is ready to fill us with fresh hope. When we are dazzled by what takes us away from true hope, but feels right in the moment, God is still with us. If we can learn to rely on this abiding presence, our lives can be gentle and generous. God’s revelation may not arrive in a blinding flash but in the subtle and myriad acts of creation that, all too often we take for granted, blinded by the cares of the world. How might our Lenten discipline help us renew our openness to the ways of God?